Canes, also known as walking canes, are just one of several assistive devices available to help you with ambulation, or walking. Using a walking cane improves balance by increasing a person’s base of support. When used correctly, canes unload the leg opposite to the hand the cane is in by up to 25 percent. This can help keep pressure off of injured body parts or allow for optimal healing to occur while still allowing you to get around safely. One caveat about using a cane: There are different types, and using the right cane can mean the difference between safe and unsafe walking. Your physical therapist is the perfect person to visit to be sure you have the right type of cane. There are different categories of canes on the market today, each providing a slightly different amount of assistance. The cane you use should fit well with your current needs and functional level. 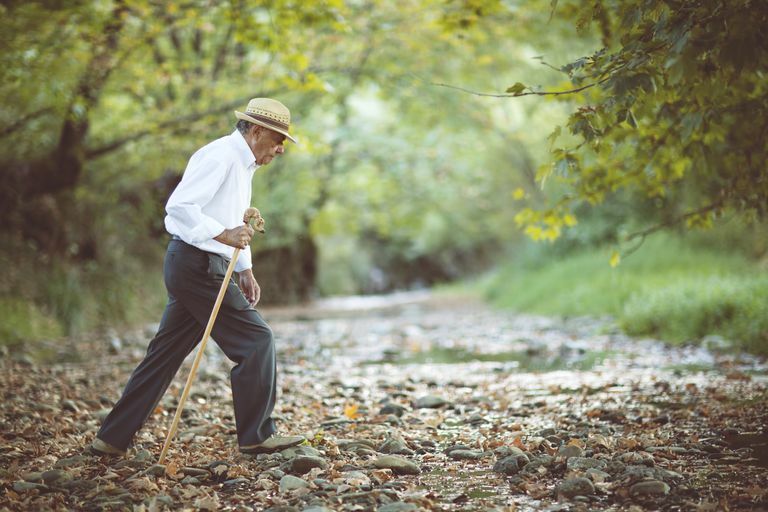 Using a cane that isn't right for you can cause you to develop poor walking postures and may lead to injury from a fall. "C" cane. The C cane is a single straight walking cane with a curve forming a handle at its top. This is the most simple of all canes. It assists in improving balance by the mechanism described above. Straight canes should be used by the patient needing only slight assist with balance or only minimal unweighting of the opposite leg. They are typically available in your local pharmacy or medical supply store. The functional grip cane. Functional grip canes are similar to the C cane except for the handle. A functional grip cane has a straight grip handle rather than a smooth curve. This allows for a better grip by the patient and an improved grip allows for better cane control and hence offers more support than the C cane. Functional grip canes are appropriate for the patient who needs slightly more balance assistance than the C cane provides. Quad cane. A walking cane with a rectangle base and four small supports that contact the floor is called a quad cane. This large base provides more support than the above two canes. Quad canes come in two varieties depending on the size of the rectangle base. Appropriately they are categorized as small base and large base quad canes. The quad cane is helpful for patients needing much more balance assistance than provided by the C cane and functional grip cane. Quad canes are often used by a person with hemiplegia, or paresis, of one arm, leg, or both. Another added benefit of the quad cane is that you don't need to set it up against something when you're not using it. The large base and four feet allow it to stand on its own. The hemiwalker. This cane combines the features of a quad cane and a walker. Its base is much larger than any of the described canes above, thus providing the most patient support. Hemiwalkers also provide an additional amount of lateral support. Patients with more severe hemiplegia or those transitioning from using a walker to a cane will benefit from the use of a hemiwalker. It is important to appropriately size canes. When standing, the arm that is grasping the cane should have a 20-degree bend in the elbow. If there is any confusion, ask your local physical therapist for assistance. Be sure you speak with your doctor or physical therapist before changing or altering your walking cane or other assistive devices, just to be sure you are using the right device for your condition. Walking with a cane or other assistive device should help you move around better. By choosing the right cane for you, you can be sure to safely get around town with minimal risk of injury.